Created by the Colorado Department of Human Services Division of Behavioral Health (DBH) to encourage whole person care, LinkingCare.org quickly connects healthcare providers and individuals to substance use resources and services. A substance use provider referral database, searchable geographically or judicial district-specific, LinkingCare.org also features other prevention, intervention, treatment and recovery information and services. LinkingCare.org supports coordination between healthcare providers and state-licensed substance use providers, helping to build and strengthen networks of providers within Colorado communities, said Brie Reimann, program director for SBIRT Colorado. 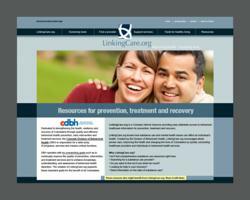 An easily accessible online substance use resource, LinkingCare.org http://linkingcare.org/Home.aspx connects healthcare providers and individuals to substance use resources and services. In a significant step toward encouraging integration between healthcare and behavioral health, SBIRT Colorado, with funding and support from the Colorado Department of Human Services Division of Behavioral Health (DBH), has collaborated with Access to Recovery, Colorado Providers Association, OMNI Institute and Peer Assistance Services, Inc. to create LinkingCare.Org, with comprehensive substance use resources for individuals, healthcare providers and substance use providers. Nearly 30 percent of Americans, though not dependent on alcohol or other drugs, consume at a level that elevates their risk for causing physical, mental or social harm. According to statistics from the National Center on Addiction and Substance Abuse at Columbia University, the State of Colorado spends approximately $202 million annually on healthcare costs due to problems related to substance use. Understanding that risky substance use affects an individual’s overall health, DBH created LinkingCare.org to encourage whole person care, quickly connecting healthcare providers and individuals to substance use resources and services. LinkingCare.org will expand to include a continuum of behavioral health resources such as substance use prevention, mental health and recovery support services. “A goal of DBH is to continually improve the quality of substance use and mental health prevention, intervention, treatment and recovery services,” said Stan Paprocki, Director of Community Prevention and Early Intervention Programs at DBH. LinkingCare.org supports this goal as a powerful, reliable statewide referral resource for access to information on substance use services for awareness, treatment and recovery.” Director Paprocki stated that the resource will expand to include a continuum of behavioral health. The Drug Abuse Warning Network’s “DAWN Live!” study reports that Colorado ranks 19 percent higher than the national average and fifth in the nation in per capita consumption of alcohol. Three in 10 Coloradans need treatment for substance use or mental health disorders each year—more than 1.5 million people. The primary challenge in treating substance use or mental health disorders is uncoordinated care. Substance use contributes to more than 70 diseases. According to the Centers for Disease Control and Prevention (CDC), alcohol and drug misuse are the third and ninth leading causes of death in the U.S., respectively, exceeding the number of deaths caused by infectious agents, motor vehicle crashes, firearms and sexually transmitted diseases combined. A 2006 CDC report estimated annual societal costs of alcohol use in the U.S. at $235 billion, including +$25 billion for medical costs; societal costs of prescription drug misuse and illicit drug use are $181 billion; and tobacco are $168 billion. The total annual cost for treating substance use problems exceeds the cost of care for diabetes ($132 billion) and cancer ($210 billion) combined. A six-state SAMHSA study that screened nearly 460,000 individuals for substance use who were hospitalized for a variety of health conditions found substance use problems in more than 20 percent of patients. The Division of Behavioral Health (DBH) exists within the Colorado Department of Human Services, Office of Behavioral Health. DBH is responsible to administer, license and regulate the provision of community-based public behavioral health system, specifically the substance use prevention, mental health promotion and early intervention, substance use disorder treatment, and mental health treatment services for the State of Colorado. A goal of DBH is to continually improve the quality of prevention, intervention, treatment and recovery services, and to enhance knowledge, understanding and awareness of behavioral health disorders. 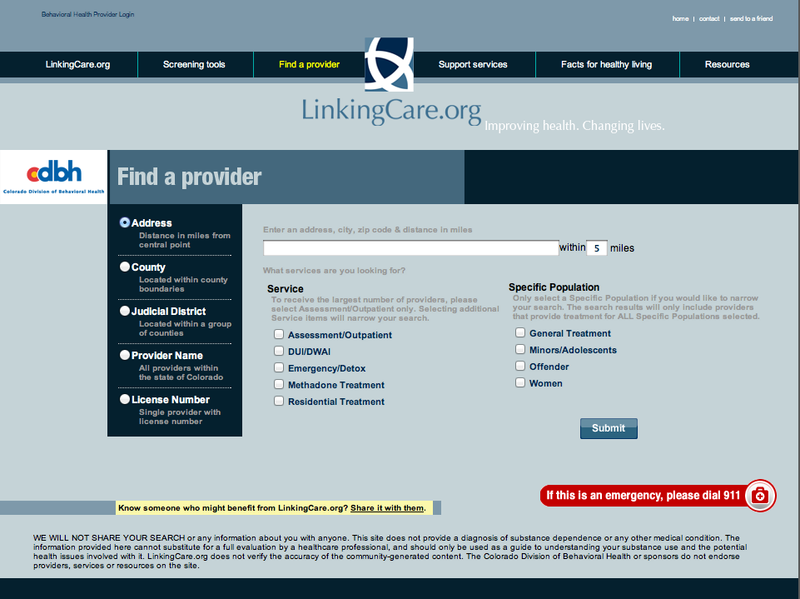 The development of LinkingCare.org supports this important goal for the benefit of all Coloradans. For more information, Colorado Division of Behavioral Health. An initiative of the office of the Governor of the State of Colorado, SBIRT Colorado was funded by a Substance Abuse and Mental Health Services Administration (SAMHSA) five-year grant in September 2006. Colorado was awarded a second five-year SBIRT grant in September 2011. SBIRT Colorado is administered by the Colorado Department of Human Services/Division of Behavioral Health, and implemented and managed by Peer Assistance Services, Inc. Screening for substance use, SBIRT (Screening, Brief Intervention and Referral to Treatment), is an evidence-based approach to prevent health and other consequences. Just as checking an individual’s blood pressure can reveal health issues and guide recommendations for a healthier lifestyle, universal screening for substance use gives healthcare providers insight to recognize a potential health problem, or to address an existing problem before it worsens or becomes fatal. The evidence of impact and cost-benefit of alcohol screening is equivalent to colorectal cancer and hypertension screening and surpasses the benefits of cervical and breast cancer screening, cholesterol screening and many other screenings routinely provided and covered by insurance. For more information, http://www.ImprovingHealthColorado.org http://www.improvinghealthcolorado.org/index.php. Image shows the 'Find a Provider' page where statewide searches for a treatment provider, specific to needs and location is initiated.Image shows the 'Find a Provider' page where statewide searches for a treatment provider, specific to needs and location is initiated.